One of my forum ladies posted a link to this woman's Facebook photos, which showed a couple of shots of a very confident and professional lady that was rocking white breeches and certainly not weighing 98lbs soaking wet. Talk about inspiration! I Google'd her name and found her website. Lady! 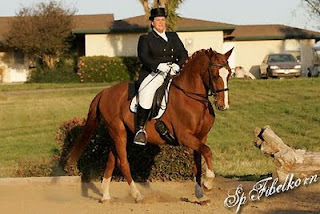 This is not just a plus sized rider TALKING about riding (like I do! ), she is DOING it - and she's DOING IT WELL - AND she is instructing others on how to do it well! 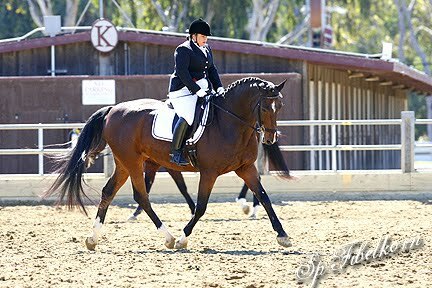 Susan Hoffman Peacock is a National Clinician, USDF 4th Level Certified Instructor/Trainer, USDF Silver Medalist and National Champion. She owns and operates the beautiful Hidden River Ranch in Corona, California. Nothing to scoff about if you ask me! What an inspiring (and not to mention stunning!) lady! Does she have a Facebook account? I'd LOVE to add her. I just got done reading over her site and she's got the loveliest horses and I like her training philosophies. Durr...never mind, I found her on FB and added her. I am very flattered to receive such praise for my riding ability. Thank you! I really think that it would have been nice to have been asked permission to post about me. All riders are self conscious about their bodies; big or small. I am hopeful that I am an inspiration to ALL riders to take the body that they were given to the hieght of their own ability. I am still a work in progress. I am trying to empower all riders by example. Sometimes that is hard for all of us!